The Integrated Education Intervention Project is a UN OCHA –Education Sector funded project aimed at addressing education capacity gaps in Monguno which is one of the eleven (11) LGAs in North East of Nigeria in most need of education intervention according to the OCHA education sector working group report. The goal of the Integrated Education Intervention Project for primary and junior secondary schools in Monguno is to provide a comprehensive intervention that addresses school structural gaps, WASH gaps, hand washing facilities deficits, gaps on scholastic materials, hygiene gaps on adolescent girls and lack of teacher skills on security and protective methods when security breaches occur in and around school buildings. 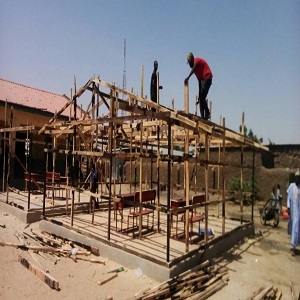 A temporary learning centre under construction in Monguno town. It is planned to provide semi-permanent structures in schools in Monguno LGA, WASH facilities in schools where they don’t exist, hand washing basins in the 4 schools, hygiene packs for adolescent girls in those 4 schools, dignity kits for all students, psychosocial training for all students and teacher training on safety and security techniques for teachers and education administrators in the selected schools. Scholastic materials would also be provided to the target pupils in the project LGA. This project commenced in December 2017 and is planned to end September 2018. The project has 5 dedicated project staff to manage its implementation. Eighty (80) teacher and school management committee members have been trained on pedagogy and management techniques. Twenty-eight (28) Temporary Learning Spaces (TLS) have been built in Monguno LGA schools and New Marte IDP camps all in Monguno town. Twelve (12) blocks of toilets have been built for 4 Monguno schools and New Marte IDP camps in Monguno town. Five hundred (500) hygiene packs have been distributed to 500 adolescent girls in Monguno schools. One thousand (1000) scholastic materials have been distributed to 1000 pupils in New Marte IDP camp, Monguno. Having successfully delivered on all project deliverables, this project was closed in August, 2018.